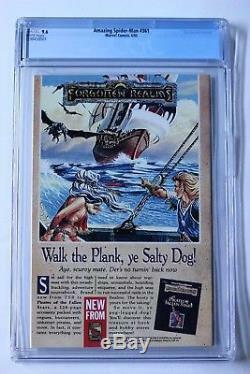 NM+ CGC graded 9.6, Amazing Spider-Man #361, WHITE PAGES. 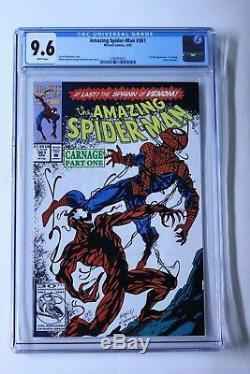 First full appearance of Carnage (Cletus Kasady), the first spawn of the Venom symbiote! Get this much sought after collector's item, just in time for the new blockbuster Venom movie! 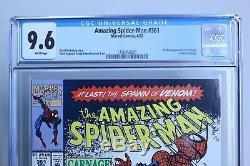 The item "Amazing Spider-Man #361 CGC 9.6, 1st Full CARNAGE! VENOM MOVIE" is in sale since Sunday, September 16, 2018. This item is in the category "Collectibles\Comics\Modern Age (1992-Now)\Superhero\Spider-Man". The seller is "the-cards" and is located in Saint Louis, Missouri. This item can be shipped to United States, Canada, United Kingdom, Denmark, Romania, Slovakia, Bulgaria, Czech republic, Finland, Hungary, Latvia, Lithuania, Malta, Estonia, Australia, Greece, Portugal, Cyprus, Slovenia, Japan, China, Sweden, South Korea, Indonesia, Taiwan, South africa, Thailand, Belgium, France, Hong Kong, Ireland, Netherlands, Poland, Spain, Italy, Germany, Austria, Israel, Mexico, New Zealand, Singapore, Switzerland, Norway, Saudi arabia, Ukraine, United arab emirates, Qatar, Kuwait, Bahrain, Croatia, Malaysia, Brazil, Chile, Colombia, Costa rica, Panama, Trinidad and tobago, Guatemala, El salvador, Honduras, Jamaica.